You are currently browsing the archive for the John Bell category. After observing the impressive response to its fledgling Digital Curation program, which has already been called “a national standard for the study of digital curation,” the University of Maine has approved a special discount for out-of-state students. In-state tuition for our Digital Curation graduate certificate is one-third the cost of out-of-state tuition–and anyone who enrolls this month can qualify for this huge discount. A HASTAC scholarship, an interview published by the Smithsonian, and a cover story in ARTnews that mentions a landmark book by one of the professors. These are among the accolades received this fall by instructors teaching next term’s online courses in Metadata and Digital Preservation, for their contributions to the growing field of digital curation. Still Water Senior Researcher John Bell has been named a 2013 HASTAC scholar, and he’s spending his time finding new ways to knit together data and the organizations that produce them. 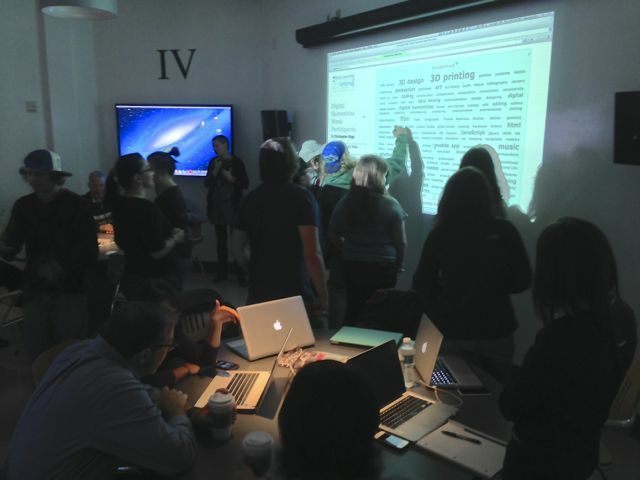 One of the challenges of Maine’s first THATCamp (the 2013 Digital Humanities Week) was how to get 60 people to decide what they want to learn together. Fortunately, several of the participants offered creative solutions that may be of use to the organizers of any democratically determined conversation. Using a 3-D printer. Custom-styling a WordPress blog. Growing your own medicine. Conducting a social media campaign with YouTube and Twitter. Is there a skill you wanted to learn but haven’t found the teacher or time to learn it? Create your own class in exactly what you want to learn at this year’s Digital Humanities Week at the University of Maine, which takes place Monday through Thursday 7-10 October. Sponsored by the New Media Department Correll Fund, Humanities Initiative, and CA/DLS, this year’s Digital Humanities Week will be Maine’s first THATCamp.